Print Version /// view warrantyQuality is not expensive - it´s priceless, and if you´re running your own business quality is everything. If they´re not working, neither are you. 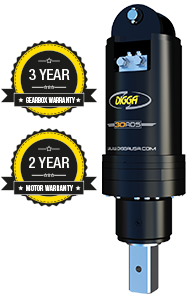 If quality and up time are important to you, then make the smart choice - use a Digga attachment. Such is the build quality of the Digga product that we can afford to offer that extra bit of peace of mind. Please note: If you wish to use a DDS / DDT drive for anchoring, an Energy Control Valve (ECV) must be fitted for the warranty to be valid. Developed in conjunction with the leading screw anchor / pile installers around the world. The only true anchor drives available, designed and manufactured inhouse by Digga, specifically for the rigours of the application. Host machine operates in the most efficient HP range, minimizing wear & tear, optimising performance, and ensuring highest returns. Overall length (in) 45.3" 45.3" 45.3" 45.3" 45.3"
Diameter (in) 14" 14" 14" 14" 14"